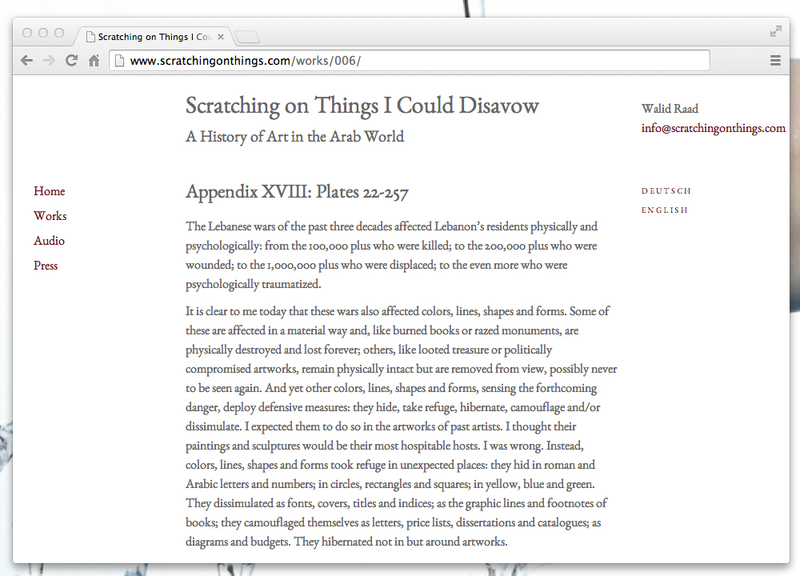 The text above is part of the ongoing project entitled Scratching on Things I Could Disavow: A History of Art in the Arab World started in 2007 by New York-based Lebanese artist WALID RAAD. This work takes a critical look at the accelerated emergence of art spaces and institutions in the Arab world, and finally to inexplicable physical phenomena like the flattening of art spaces, the shrinking of artworks, and the availability of colors, lines, and forms for contemporary Arab artistic creation. I highly recommend to visit http://www.scratchingonthings.com/ for more texts and images. ➝ WALID RAAD is currently having a solo exhibition at Carré d’Art in Nîmes, France which is running until September 14, 2014.